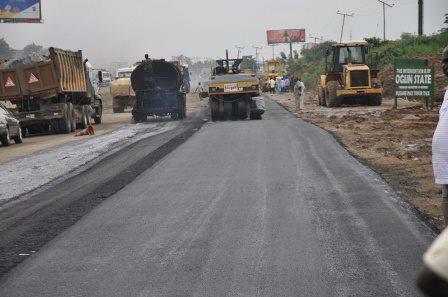 The Ogun State House of Assembly has charged the State Road Management Agency to step up plan to fast track rehabilitation and maintenance of more roads across the State. The Chairman, State House Committee on Works and Infrastructure, Hon. Olayiwola Ojodu gave the charge during the budget assessment tour to the Ministry of Works, Oke-Mosan, Abeokuta. Hon. Ojodu who commended the Agency for its efforts in maintaining high standard roads and flood control, describing good road network as a catalyst for the socio-economic development of the State. He also appealed to the Federal Government to reimburse funds expended on federal roads to the State Government so as to have more resources to fund on-going infrastructural projects across the State. In his remarks, the Project Manager of the Agency, Engr. Ademola Adelana said that the agency had been working on maintenance and rehabilitation of roads as well as clearing of blocked drainage across the three Senatorial districts of the State. He assured that ongoing filling of potholes would be intensified as palliative measures would be given to all roads within the State, noting that the Agency had rehabilitated Abeokuta, Sagamu, Ikenne, Siun/Ajura/Ogere, Ijebu Ife/Itele/Ijebu Ode roads. Responding, the Permanent Secretary in the Ministry,Engr. Kayode Ademolake said the Works Ministry had generated N73m, while also complementing the urban renewal, rural and Infrastructural development being put in place by the Senator Ibikunle Amosun led administration. Ademolake said despite the dwindling financial challenges nationwide, N21b was budgeted out of which N18b had been expended on road projects across the State and more rural road projects would be embarked upon. Meanwhile, the Director, Power Resources and Services in the Bureau of Electrical Engineering Services (BEES), Engr. Jonathan said more areas would benefit from the intervention programme on electrification, especially the rural areas being the major focus of the present dispensation.